This is a very rare 1980 Litestar or GCRV (ground cruising recreational vehicle). It was originally known as an Autocycle but was renamed to Litestar. This is very close in design to the Pulse (you can find out more about my Pulse from the main car page). They were built in the early 80's in Scranton, Iowa and were the design of the famous Aeronautical Engineer Jim Bede. He was responsible for the BD5 kit Airplane (this was the jet seen in the James Bond movie Octapussy). These are very RARE as only 12 were ever built!! It's fun driving because you feel like you're in a jet airplane!! This one sports a 450cc air cooled 1980's Hondamatic motorcycle engine. It is a two speed automatic with no clutch. It has a handle on the right side to shift with. It has 4 wheels, two motorcycle wheels and two small outrigger wheels one on each wing. The outrigger wheels provide balance for the vehicle while it is at rest or while in a turn. Only one of the two outrigger tires touches the ground at a time. Because of this it is considered a 3 wheeled vehicle and is normally licensed as a motorcycle. The vehicle is constructed of welded steel tubing with a fiberglass body. The front windshield, headlight shields and canopy are all made of strong clear Plexiglass. 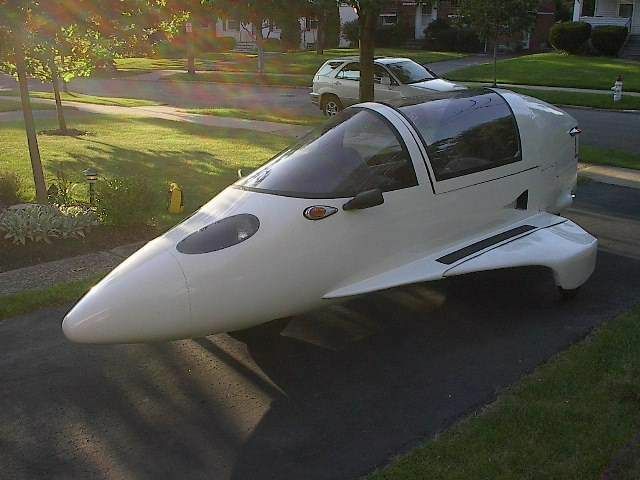 This vehicle is extremely futuristic looking and was even featured in one of the Back to The Future Movies. This vehicle is very aerodynamic and has 10 times less drag than a standard motocycle and its rider. This GCRV seats two people in tandem but you will always want to be the one in the drivers seat!! I have taken this vehicle to car shows and people absolutely go nuts over this thing!! I have seen at least 40 people gathered around it at shows.